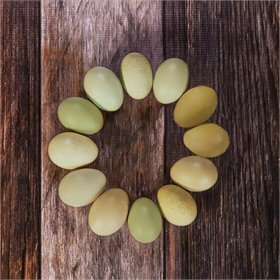 Some olive eggs are speckled! 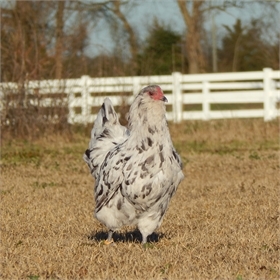 Easter Egger hen - custom cross! 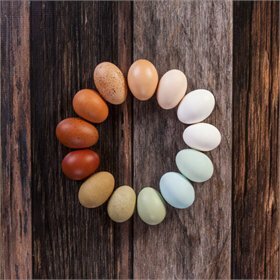 This assortment of intense and unusually-colored eggs will knock your socks off! It's one of our most popular assortments--everyone loves a gorgeous egg basket. 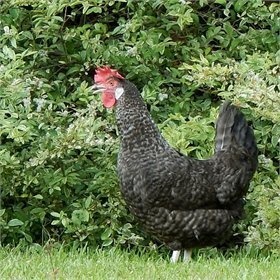 Barred Favaucana – We love our Favacaunas!They will be Blue/Black/Splash barred chicks, 94% of which lay a nice green egg. Easter Egger – These are custom crosses! 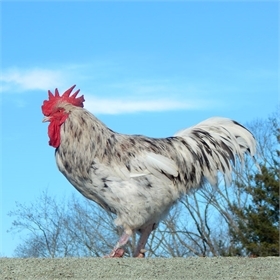 We breed for big eggs, frequent rate of lay, big beards, and hardiness. 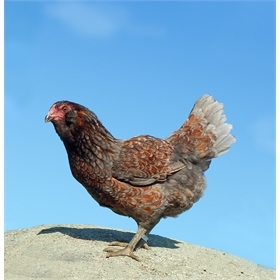 You'll find they're reliable layers of green and blue-green tinted eggs. 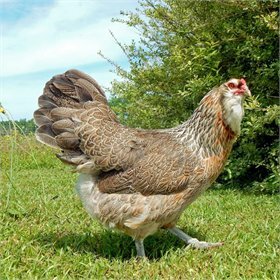 Flowery Easter Egger – Most of these chicks will hatch crested, and grow into large, friendly birds that will lay green eggs. 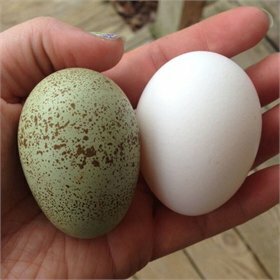 (About 6% will lay a light brown egg.) All of the flash of a Blommehonne, with production-like laying. 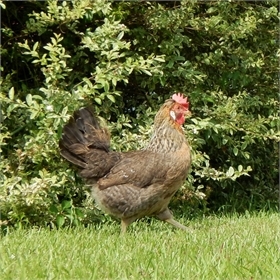 Green Magnolia – A beautiful auto sexing green egg layer that are good foragers and friendly. Some will be crested! 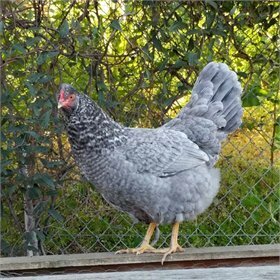 Lavender Ameraucana – Need we say more?Lavender color, beards and muffs, and blue-tinted eggs. We don't take breed requests for this assortment. 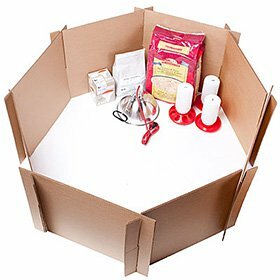 Please note: many varieties included in this assortment are F1 and will arrive in shades of brown and white. 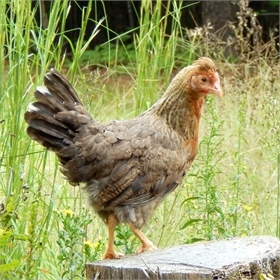 The color of the eggs received may not correspond to the color of eggs you can expect from the chicks that you hatch. 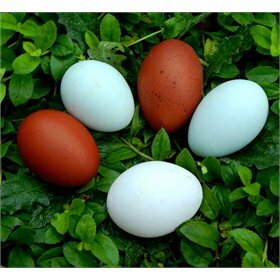 If you're up to some Super Sleuthing, order some "Mystery Eggs" and see if you can guess what birds you've receivedThe color of the hatching egg may provide a clue but you'll need to wait until the chick hatches to see if you're even half right -- the possibilities are almost endless. 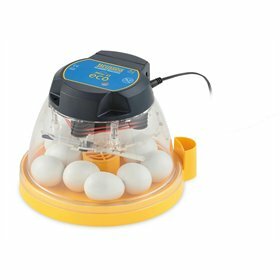 At $13.95 for (3) Mystery Eggs, it is a great deal, too. 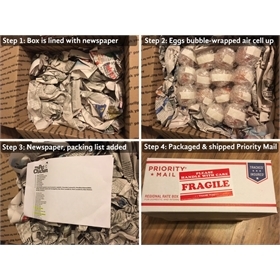 So order some Mystery Eggs...make some observations...consider the possibilities...and see if you can crack the code. 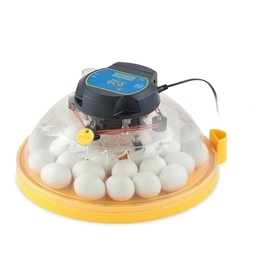 These Mystery Eggs may hatch large fowl, bantams, known breeds and unknown breeds. We like making our customers happy. You'll likely receive free egg(s) with your purchase.